On Saturday, December 15, 2018, nine Felicity-Franklin FFA members traveled to Columbus, Ohio to compete in the State Novice Parliamentary Procedure Leadership Development Event. Members of the team included Luke Jennings, Audrey Pinger, Anna Swisshelm, Alisha Boone, Carly McClure, Trinity Evans, Emily Hardewig, and Emma Robertson, who competed in the state contest. Alternate Brooklyn Wehrum also practiced with the team but did not compete in the State Parliamentary Procedure Leadership Development Event. During the Leadership Development Event (LDE), members hold a mock meeting by conducting FFA opening and closing ceremonies, making motions, debating on motions, and answering oral questions about parliamentary procedure. After winning their room in the preliminary competition, Felicity FFA advanced to finals to compete against four other teams. 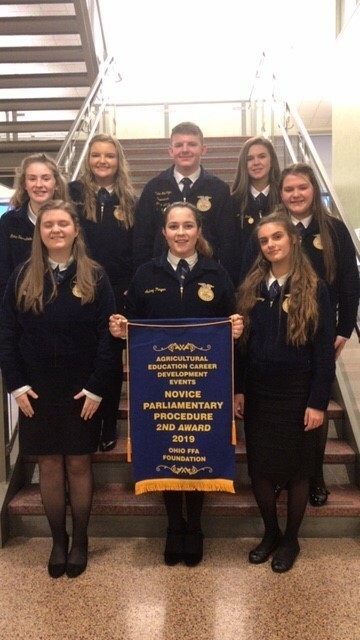 Felicity-Franklin FFA’s Novice Parliamentary Procedure team placed second in the state of Ohio, earning the first ever banner (awarded only to teams who place in the top five in the state) for the Parliamentary Procedure LDE for Felicity. Front row from left: Trinity Evans, Audrey Pinger, and Emily Hardewig. Second row: Anna Swisshelm and Emma Robertson. Back row: Carly McClure, Luke Jennings, and Alisha Boone. The team of eight earned Felicity FFA’s first parliamentary procedure banner after placing second in the state.